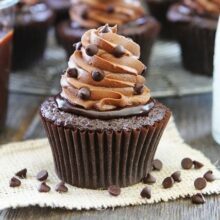 The Ultimate Chocolate Cupcake recipe -make chocolate cupcakes with silky chocolate ganache and the BEST chocolate buttercream frosting. 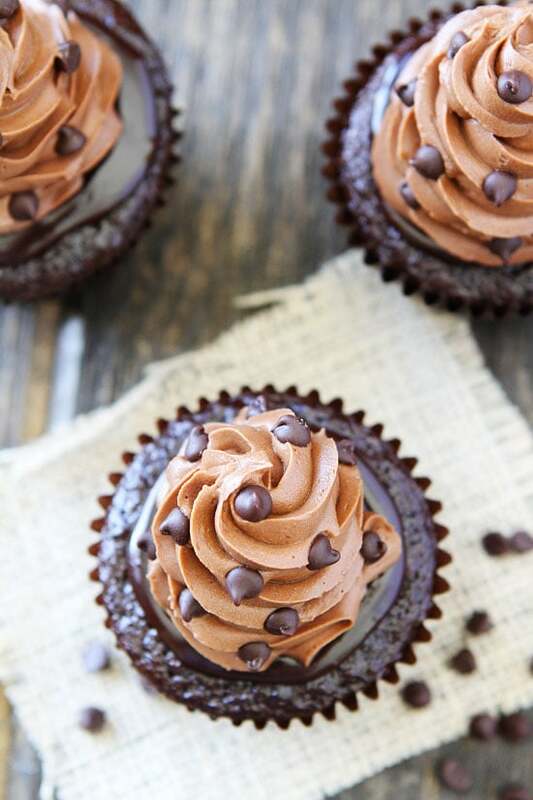 Chocolate lovers, these chocolate cupcakes are for you! If you like chocolate, you are in for a real treat today! I created the Ultimate Chocolate Cupcake Recipe. I’ve sampled a lot of chocolate cupcakes from bakeries around the country and I have to say that my Ultimate Chocolate Cupcakes are the best. I don’t mean to brag, but it’s true. I am so in love with these chocolate cupcakes. Top with the BEST chocolate buttercream frosting. Add mini chocolate chips because they are cute and the more chocolate the better, right? The basic chocolate cupcake recipe is simple. 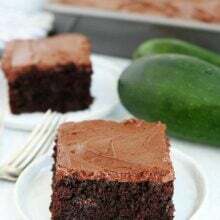 Super moist and super chocolaty! After the cupcakes have cooled completely, I spoon the chocolate ganache on top. It is silky, smooth, and the cupcakes would be good if I stopped here, but to have the ultimate chocolate cupcake, you need chocolate buttercream frosting. I am normally not a big frosting fan. I like a little, but usually scrape most of it off. Not with this chocolate buttercream though. It is hands down the best chocolate frosting I’ve ever tasted. I could eat it by the spoonful! It is the perfect finish to my chocolate cupcakes! I like to pipe a big swirl on top of the cupcakes. The mini chocolate chips just add a nice little decoration. Chocolate sprinkles would also be fun! Look at that puddle of chocolate ganache! Mmmmm! Make sure you grab a glass of milk to go with these cupcakes. They are RICH! I didn’t think I would be able to eat an entire cupcake by myself. I told Caleb I would share with him, but I ended up eating every last crumb. He had to get his own:) They are rich, but not too rich. I could devour one any day! 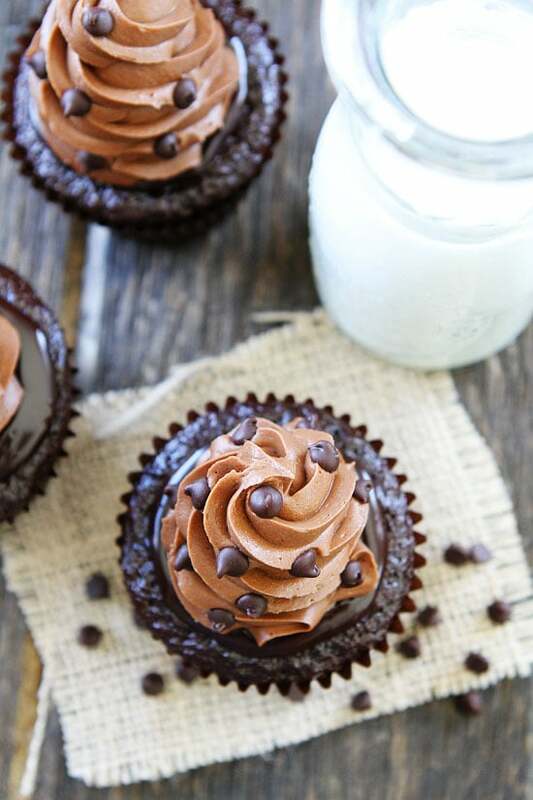 This Ultimate Chocolate Cupcake recipe is perfect for any celebration. I will be requesting these chocolate cupcakes for my birthday! And if you don’t have anything to celebrate, think again. Every day is a celebration, especially when you have Ultimate Chocolate Cupcakes. They are the BEST cupcakes. Enjoy! 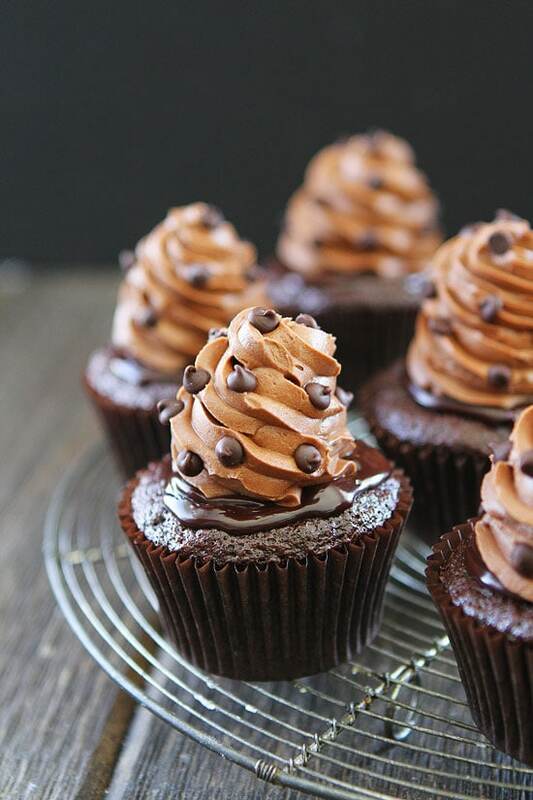 The BEST chocolate cupcakes you will ever eat. Preheat oven to 350 degrees F. Line muffin tins with paper liners. Set aside. In the bowl of a stand mixer, stir together sugar, flour, cocoa, baking powder, baking soda and salt. Add eggs, milk, oil and vanilla. Beat on medium speed for one minute or until batter is smooth. Slowly pour in boiling water and mix until batter is smooth. Don't over mix. Fill liners about 1/2 full with batter. Bake cupcakes for 18-22 minutes or until a toothpick inserted in the center comes out clean. Remove from oven and cool completely on wire rack before frosting. While the cupcakes are cooling, make the frosting. In the bowl of stand mixer, beat the butter on medium speed until light and fluffy, about 2-3 minutes. Gradually add the powdered sugar and mix until the frosting is smooth, about 3-4 minutes. Mix in the vanilla. 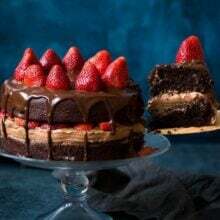 Drizzle in the cooled melted chocolate and beat on medium speed until the frosting is smooth and creamy. To make the chocolate ganache, add the chocolate chips to a medium bowl. Heat the cream in a small saucepan over medium heat just until it bubbles around the edges or you can heat it in the microwave. Pour cream over the chocolate chips. Let the mixture stand for 30 seconds, then stir until the chocolate melts and a smooth ganache comes together, about 1-2 minutes. Place the frosting in a pastry bag. Spoon the ganache onto the center of the cupcake. Spread to the edge of the cupcake. Let the cupcakes sit until the ganache firms up, about 5 minutes. Pipe chocolate buttercream frosting over the ganache. Decorate with mini chocolate chips, if desired. Note-if you want to pipe a high frosting swirl on the cupcakes, you might need to double the frosting recipe. It just depends on how high you go with the frosting. I love chocolate and I definitely love these cupcakes! They look so beautiful! Wow, Maria, it doesn’t get much better than this! These looks absolutely mouth-watering! These are perfect for a birthday celebration! I hope your family enjoys them! SOOO this is EXACTLY what my face needs on Monday morning. Chocolate is the ONLY way to get through the first day of the week…and this has LOADS of it! DELISH. Pinned! What a yummy way to start out the week!! Maria, these cupcakes are seriously the ultimate chocolate cupcakes! Chocolate cupcakes with ganache AND chocolate buttercream; yeah, amazing! Oh man, I would love to sink my teeth into one of these!! If you need me, I’ll be diving head first into these amazing cupcakes!! Bring on the chocolate is right! I’d like to cuddle up with a good book and one of these babies right now! These look so good Maria! Yum! My inner chocoholic is totally wanting to stop everything (including cooking dinner) and make these. The ganache plus the frosting makes it amazing, I’m sure! Oh me me! I love chocolate! These looks incredible, over-the-top and magical all at once! I’m not usually a big buttercream fan either, but these look amazing. What can i use to substitute the Dutch processed cocoa with i have unsweetened hershys cocoa and sweetened cocoa which one would be better? Your cake recipe is pretty much identical to my favorite cupcake ever (from Cupcake Wars) http://www.foodnetwork.com/recipes/chocolate-truffle-cupcakes-recipe.html Yum! I do substitute milk for the boiling water (hot coffee in their recipe). Yours are really pretty. I will decorate them this way next time. 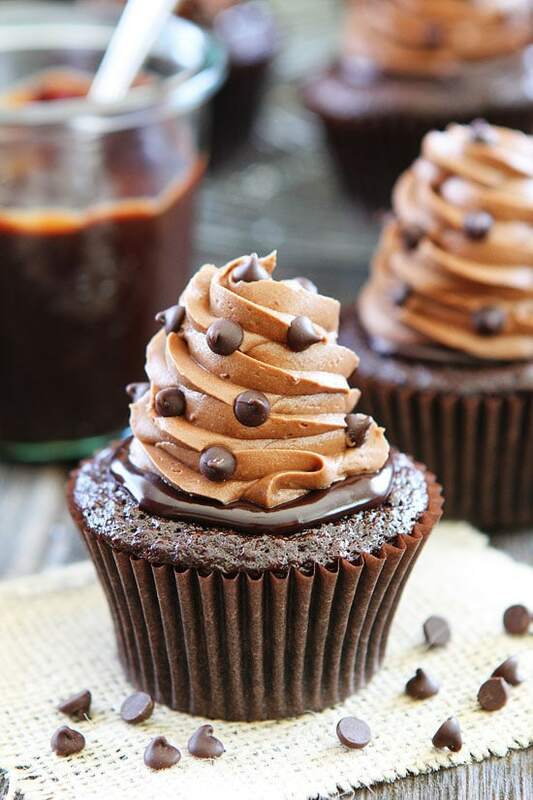 This is definitely a chocolate lover’s cupcake! Although I don’t like to eat a lot of frosting at once, I do love the look of the mountain of frosting on top. Oh my word, these are stunning! I just want to read right into my screen and grab one! These cupcakes look ridiculously good!!! O my goodness! These cupcakes look amazing–I think I’ve found my new favorite dessert. I don’t get this idea of cupcakes not covered to the edge. Every one I have had has been dry where there is cake left uncovered. I agree it presents a pleasing aesthetic , but is there a way to prevent exposed cake from drying? These look heavenly! Ultimate chocolate cupcake! WOW. There would be no scraping off that delicious frosting off those cupcakes! Give me a spoon! So I’m completely inexperienced in piping, but I’d love to make cupcakes that look just like this. They’re beautiful! What kind of tip did you use? And how big was it? Thanks so much for the recipe. Can’t wait to make these. Love these cupcakes. My kids think it’s like Kara’s cupcake except homemade. I did not do the ganache but still taste good. Just enough sweetness. My frosting did not look picture perfect as I just used a ziplock bag with tip cut out. Looks better after I added the mini chocolate chip. I would love to try these but I don’t want to make so many, would it be possible to half this recipe ? My son and I made these for his soccer team. We were doubtful when we saw how thin the batter was. But these came out perfectly. They were most and light with a nice crumb–delicious! Definitely our new go-to cupcake recipe. Just checking what sort of semi sweet choc chips to buy? Also with heavy cream do you mean double cream? Any brand of chocolate chips will work. I use heavy cream, but double cream will work too. I just made these, but I used cake flour and a cup of boiling fresh coffee in place of the cup of water. These cupcakes turned out to be light and fluffy with a nice chocolate flavor (I used Hershey’s natural unsweetened cocoa). I would totally make these again they were delicious! Glad you liked the cupcakes! Do I have to use Dutch processed or can I use regular cocoa? I’ve read up on Dutch Process Cocoa and the information I get is that it doesn’t work well if you have baking soda in the recipe. “When a chocolate recipe calls for baking soda, using Dutch process cocoa doesn’t fare well. The cake made with Dutch process cocoa, right, doesn’t rise and has a soapy aftertaste.” Perhaps the fact that this recipe calls for both baking soda and baking powder makes this case different? Appreciate your thoughts. I make the recipe with soda and powder and they turn out great with the Dutch Process Cocoa. Interesting though! This is a wonderful cupcake recipe. They bake up beautifully and once cool, the paper liner comes off really well. I lessened the sugar by 1/2 cup and they are great. Can this recipe be easily halved!? Super delicious and yummy… I baked the cupcakes with your recipe with my 4 year old daughter and they turned out to be amazing and very easy to bake!! I’m confused it’s looks to watery to me when I tried ! The worst cupcakes I have ever made. Far too much baking powder and soda…. Where’s the chocolates? Such a waste of my product s…. 2) The cupcakes should ONLY be filled 1/2 full (or less) because these don’t rise like cupcakes normally would and any excess just runs out onto the pan. 3)Because of problem 2 above, I suggest letting the cupcakes cool in the cupcake pan a little before trying to take them out. I think these will be good, but because of the run over, most are unattractive. This would be fine for just my family but I made them intending them for a party. I had to write to you guys and tell you how AMAZING these cupcakes turned out. I wish I could post the pictures I took of them, they looked so delicious in your pictures but when I tasted them after I tried your recipe, I literally melted to the floor. 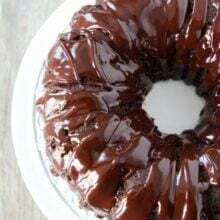 I’m a home baker and have tried so many variations to perfect a good chocolate cake recipe and I have to tell you, yours knocked every one of them out the water. I’m a newbie to your blog but you have gained a loyal follower out of me. Thank you. Thank you thank you thank you!! Just made these for my daughter’s second birthday. They are perfect! Rich yet light. The icing is incredible. Everyone loved them and asked for the recipe! I don’t make cupcakes…will the batter make a 13 x 9″ cake??? These were terrible. Waste of time and money. So disappointed. You probably made them wrong. Yum these cupcakes were amazing. I made them for my son’s birthday party, they were a huge hit!! I am going to make these for my math class. We are having a Christmas party tomorrow, so would it be okay to make them the night before? Also these look AMAZING!!!!!!!!! If I had one right now I would devour it on about 3 minutes. Yes, you can make them the night before. Enjoy! 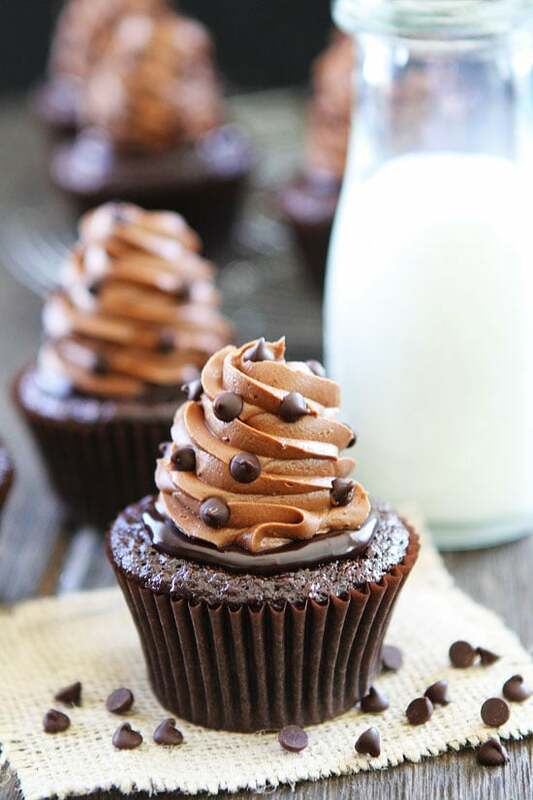 This is my ABSOLUTE FAVORITE chocolate cupcake recipe! It is so simple and only requires the most basic ingredients! I made this for my family and got so many compliments. The frosting was very good. Usually I would use cocoa powder the melted chocolate just gave it that very rich chocolate flavor! I would totally recommend this! I am making these for the second time next week. They are as named “Ultimate” This recipe is perfection! This is my go to site first when looking for a new recipe, I would love to see a mocha version. All I changed was substituting freshly brewed coffee for the water as other comments suggested….oh and I need to double the frosting next time (maybe my favorite part! 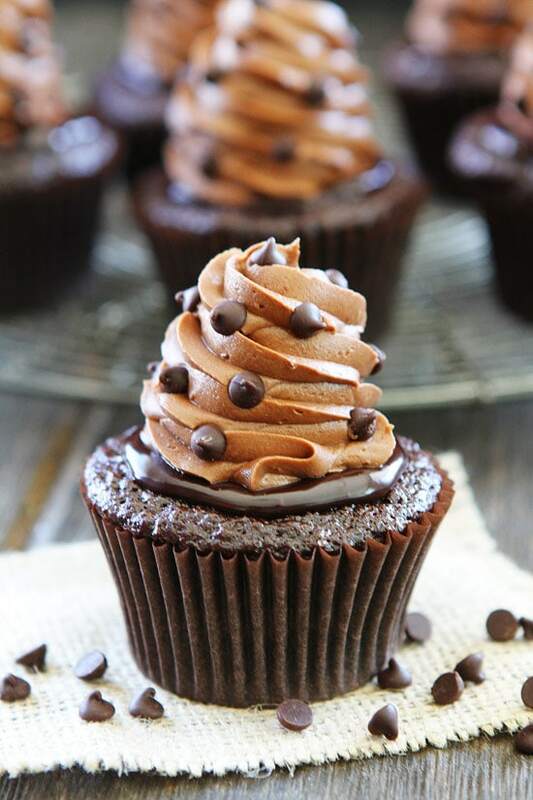 )….but I couldn’t agree more — these are the BEST chocolate cupcakes EVER!! I will never use another recipe again!! <3 <3 <3 <3 <3 Forget starts, this one gets 5 hearts!! I didn’t hear the question but the answer is definently these cupcakes! These are really the BEST chocolate cupcakes ever. So Glad I found your recipe. This ones goes in the family recipe book! What piping tip did you use to achieve the tall peak? I’ve tried so many chocolate cupcake recipes, and I will try yours next. I’m pretty sure it will taste as good as it looks. I’ll come back and rate them after I bake them. I tried cutting the recipe in half cuz I didn’t have enough sugar to make the whole batch and it didn’t come out the same. It’s worth making the whole batch for sure, these are the best cupcakes I’ve ever made. Delicious!!! I made them for my hubby and he devoured them. …ok, I helped, lol. Great, easy to follow recipe and they are beyond delicious!!! They are now my go to!! For some reason my cupcakes sunk like a hole. Just made the moistest and softest cucpacakrs so far. The recipe is super easy and definitely one for keeps! Thanks for sharing. Triple chocolate threat! My mom would LOVE these…can’t wait to make them for her sometime! My frosting wonderful but my cupcakes came out with a very strange pudding type consistency, I don’t know why?? 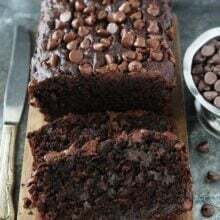 This cupcake recipe is the Hershey’s “Perfectly Chocolate” Chocolate Cake recipe from the Hershey’s Classic Recipes cookbook. The batter is always runny, but you can pour it into a pitcher to make filling your cupcake pans easier. Love the pitcher idea! Great tip! When I made these cupcakes they turned out amazing and they were nothing but delicious I’ll be sure to reside this website when I need a great cupcake to bring me up!!! Thanks so much! I love this recipe and will definitely be making it again. I’m not a fan of the mini chocolate chip thing but that’s just me. Thanks again! These cupcakes look wonderful. I’d like to make them in mini size for an upcoming English tea party. Can you advise as to time and temperature for baking mini sized cupcakes? These cupcakes are amazing and have become my go to, thank you for the recipe.